We have another fantastic event for the books. Our April event, "Build Your Brand," encouraged attendees to start spring cleaning. Personal branding is all about uncovering the true self to achieve goals, and this event taught us how to get on the right path to feel more fulfilled in our lives-both personally and professionally. We heard from a wonderful speaker and then broke into smaller groups to continue the conversation about how we can improve our situations. Donna Ceriani is a leadership success coach who has been in the technology industry for 35 years. She has a strategy for achieving goals by finding passions and strengths through self-discovery. Donna shared her strategy (based on five fundamental steps) to teach us how to accelerate our success and confidently uncover our brands. The breakout sessions let us talk in small groups on how to improve our resumes, interview skills, and LinkedIn accounts and how to be visible in our roles. We have several tools at our disposal, and we want to leverage those as best as we can. We are going to use Donna's Success Compass to find the paths to our best selves.With a reputation for helping people realize their highest potential, Donna Ceriani is the coach leaders reach out to when they want to increase their impact and advance their careers. As the founder of Success Compass, Donna works with leaders in technology who are facing a continuous stream of change, choices, and opportunities. They want to be inspiring leaders and get great results with their teams but aren't sure what their next move should be. They're working hard, putting in the time, doing what they should be doing, but not getting the results they want. 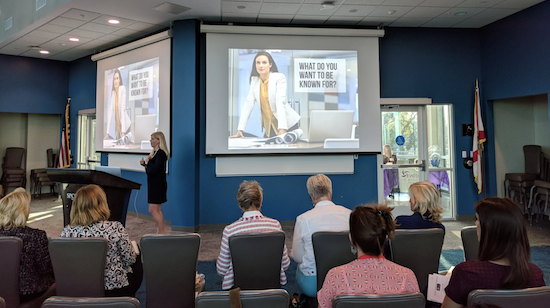 WITI South Florida provides a local forum for women to network with each other, forge connections, share resources, and discover opportunities in the technology industry.